Beads of sweat trickled down his back as he struggled to hold posture. Days turned to months, months to years and decades, but the weight bearing down on his shoulders only grew. Despite the incessant weight on his shoulders the single thought running thorough this mind throughout the years was not about the pain or the lack of companions, but pride, in defying all odds and managing to keep his honor. Every single time the weight seemed too much to bear or when it seemed to slip from his fingers, he was tempted to let go, maybe not forever, just a brief pause perhaps. He most definitely deserved it, he reasoned with himself. But he knew that a moment’s pause was all it took for worlds to come crashing down taking all his years of toil with him. He had no choice, he told himself, but to rally own, straining every muscle to a point where he was sure they would burst, spending every ounce of energy he could muster. He thought he heard someone call out his name. It couldn’t be, he told himself, must be the exhaustion playing tricks with his mind. He heard it again, this time however it seemed too real to be just voices in his head. However even if there was someone calling out his name, he was not willing to spend any precious energy on lifting his head. The silence that followed was almost deafening. Atlas was unsure of his own thoughts, as the sheer gravity of the exchange bore down on him. He closed his eyes in an attempt to gain a perspective on the things that had been said. In the silence that ensured, even sound rustle of the sweat bead as it rolled down Atlas’s back was audible. 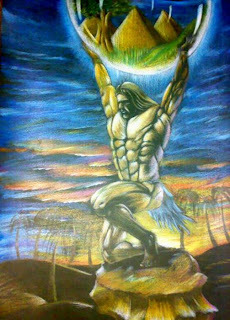 As Atlas opened his eyes trying to gauge what Prometheus expected of him, he realized Prometheus was nowhere to be seen. Atlas called out his name, in vain. As he began to wonder if this was trickery of his brain or that of Prometheus, an elaborate plan where Atlas would now abandon the skies and go in his pursuit, he realized that the burden of the conversation, real or imaginary exceeded the weight of the skies. And Atlas….shrugged.